16.10.2008, 1 Share of Common Stock á US-$ 0,01, #LB34793, Vignette von Mayer Lehman und Emanuel Lehman. 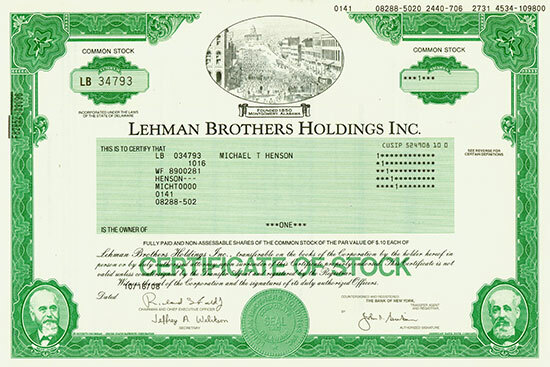 16 October 2008, 1 Share of Common Stock á US-$ 0.01, #LB34793, vignette of Mayer Lehman and Emanuel Lehman. Die Brüder Henry, Emanuel und Mayer Lehman wanderten zwischen 1844 und 1850 vom unterfränkischen Rimpar (Nähe Würzburg) nach Montgomery (Alabama) aus. Die drei gründeten in den folgenden Jahren die Investmentbank Lehman Brothers! 2008 wurde Lehman durch die Pleite zum Symbol für die Finanzkrise. Between 1844 and 1850 the brothers Henry, Emanuel and Mayer Lehman emigrated from Rimpar in Lower Franconia (not far from our auction place Würzburg) to Montgomery (Alabama). In the following years the three brothers founded the investment bank Lehman Brothers. The failure of Lehman Brothers is the symbol of our latest financial crisis.